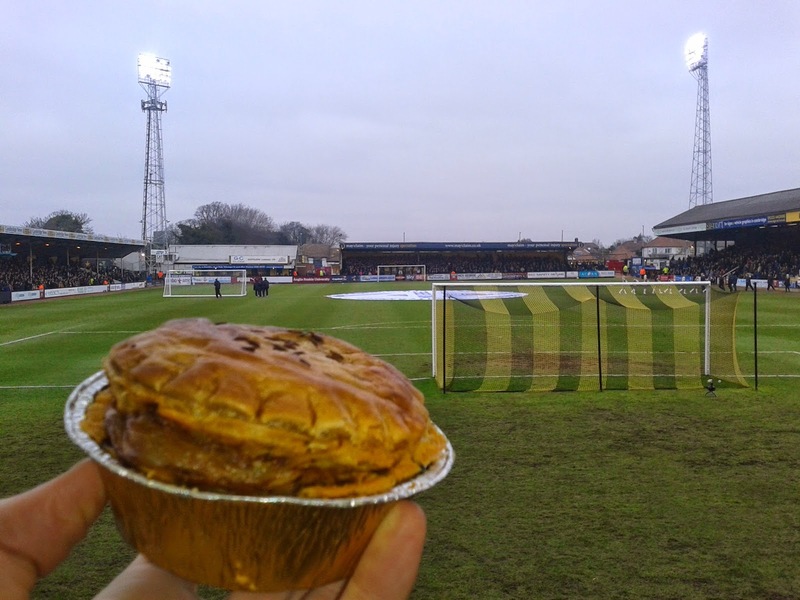 It is always good to see a club return to the football league, particularly if it gives a fresh option for a football pie review to add to our Football Pie League (AKA Pieremiership). Pierateer RAS and myself went to see Cambridge United take on Wycombe Wanderers at the Abbey Stadium. It was an old stadium with a bit of character, but not a lot, especially in the slightly newer away end that we were in. Still, it was much more interesting than a lot of the boring modern stadiums I have been too. The Pierateers straight away made a bee line for the food counter and quickly realised that the pie choices were disappointingly limited; there was only one type available. You might think that if only one pie was available it would naturally be Steak & Kidney or Beef & Onion, but no! Cambridge had only a Chicken Balti pie! Okay, it is quite a classic in a football sense but this just seemed odd to us. I could see Pierateer RAS struggling to come to terms with this situation. Why? Well he doesn't actually like Chicken Balti so no football pie for him. Shame, but there was no reason for me to not get tucked in! The only problem was they wanted me to part with £3.50 for it. I was so shocked I almost ordered a pasty by mistake, I think it is the most expensive football pie I have ever had! The lady serving told me it was a Pukka Pie, but having seen a fair few Pukka's in our time, including the Chicken Balti, we were very sceptical. Therefore we decided to investigate after the game. Despite being away fans we just started to wander around the stadium. I was shocked and quite angry to see that the pies were selling for £3 in the home end. Talk about fleecing the away supporters! We found a girl who had been working in a food kiosk. She didn't know who the pies were made by, neither did the next couple of people, but eventually the trail led us to Paul, who was the Catering & Functions Manager at Abbey Stadium. He was most helpful, giving us the facts about their pies. When we questioned him about the reason that only Chicken Balti pies were available he said that is the only flavour the fans want! Turns out the home fans prefer steak slices to steak pies. I think this is the first time I have ever thought to myself 'blooming Southerners', despite being a Southerner myself! Have you seen our views on the perfect football pie? 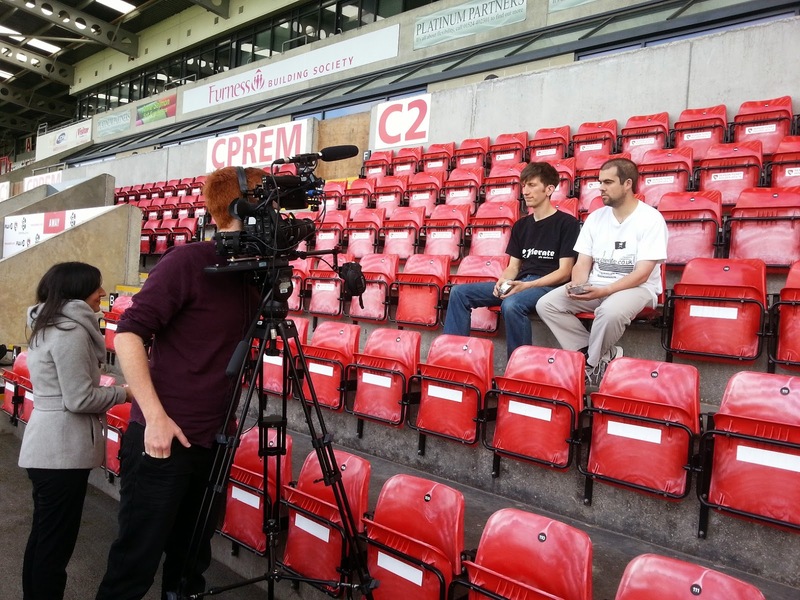 We were filmed by BBC Sport and gave our views in our article "The Pies of Football" - also featuring the video on the BBC Sport website! So who are Wrights? Having looked them up it seems they are pretty big players in the pie world of Stoke-on-Trent, with loads of bakeries there. It was nice to find a different company which we hadn't tried before. I seem to remember that Tom Dickinson hated them in 92 Pies but I thought they were pretty good. The key was that the pie was cooked properly, despite the ropey oven that Paul claimed Cambridge have. It is often the case that a good football pie turns bad by being dried to a crisp. For us it was also good to see another win for promotion hopefuls Wycombe. However, their success this season means that they have sold a couple of players and this perhaps showed with a less than vintage performance. But a win is a win and a decent pie with a win... well that's win win. Condition – 3.8 out of 7 – Pie explosion! The filling had lifted the lid. This did indicate it was well filled but it wasn't so pretty. The cumin seeds on top indicated curry and were a nice touch. Colour – 4.5 out of 7 – Brown rather than golden but not burnt which is the main thing. Cheapness – 3.2 out of 7 – The prices were just written on a chalk board, perhaps someone made a mistake with the £3.50 price for away fans. However, I can only score on what I was charged and it needs to be a gourmet pie for that price. Capacity – 5.5 out of 7 – Quite a large capacity because this was a tall pie. A small airgap considering the size, overall a well filled pie although quite a bit of it was sauce. It is also worth noting it was fairly big, around 250g I would say. Chewiness – 4.7 out of 7 – The pastry lid was nice and crumbly but the base was a bit soggy. The filling slipped down well, it wasn't at all chewy. Content – 4.1 out of 7 – The content was okay, the meat was decent enough but the flavour was a bit bland for me. It tasted really similar to the Phat Pasty Chicken Balti. I prefer the spicy filling of the Pukka version. 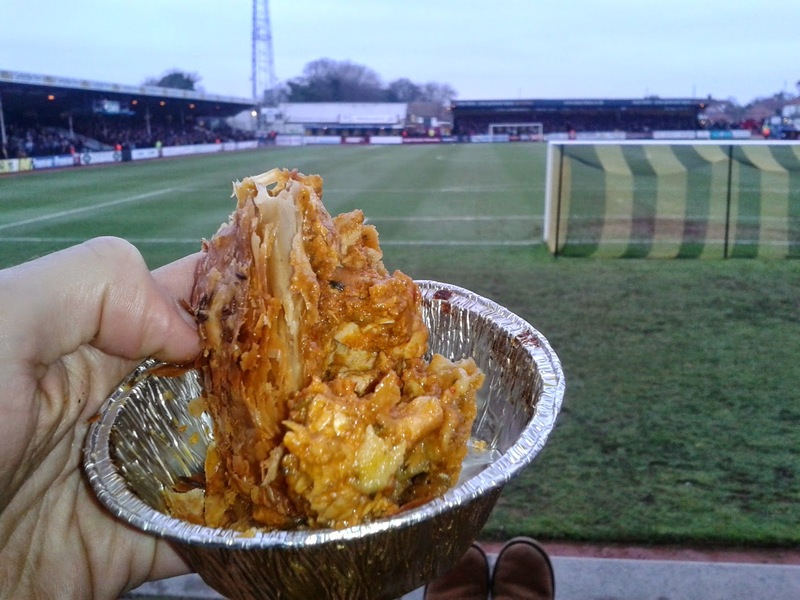 Consistency – 5.0 out of 7 – This pie worked well as a football pie, it held together nicely and the sauce was thick. The filling went well with the pastry.